Sorry I've been absent... my day job gets in the way of my blogging habit! While I was working out of town the other week, our dishwasher decided to have a minor meltdown. 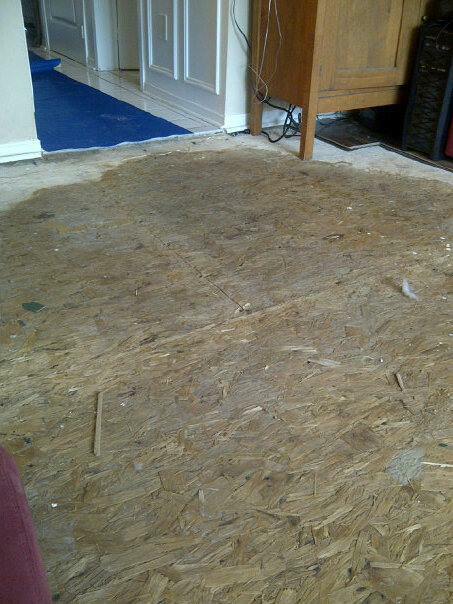 Minor, to the tune of having to remove ALL of the kitchen flooring, and all of the attatched living room floor as well. 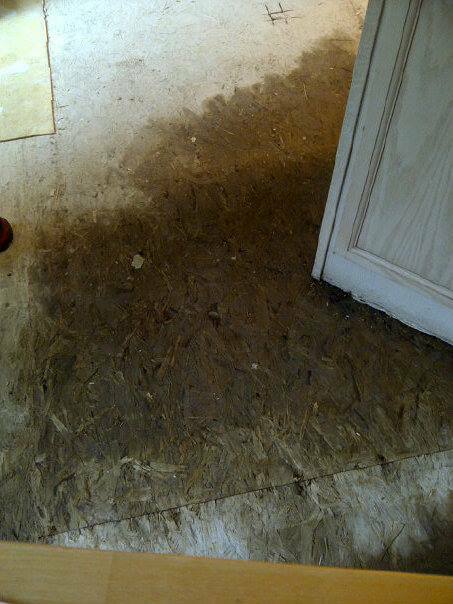 Also, it was raining in the basement! NOT as much fun as it might sound. The net result is that I need to have our dining room chairs fixed/refinished, since those were in the basement and took the brunt of the water damage (well, the dog beds stored on top of the pile of chairs took the BRUNT of the damage, but the chairs suffered mightily). Also, as I mentioned, the kitchen and open-to-the-kitchen living room had to have their floors removed so that we could prevent mold, fungus, decay, whatever it is you get when wet things sit for a long time. So, my darling husband and I decided, since we have been contemplating kitchen updates forEVER, to take this giant life-lemon and make some lemonaid. Expensive lemonaid. eesh. 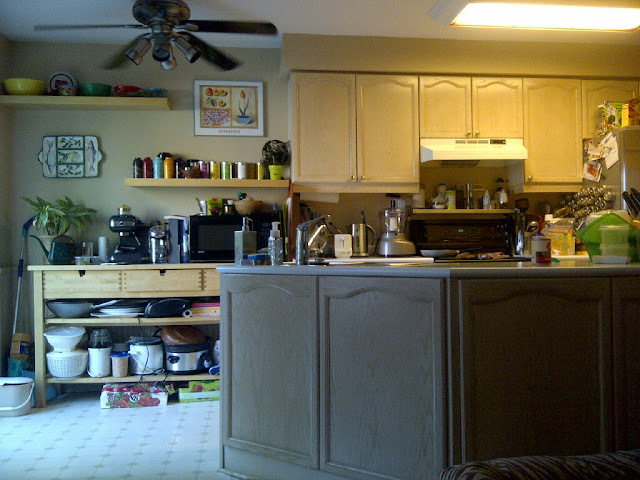 We have contracted with renovators, highly recommended by almost everyone I work with (and those who didn't recommend them just didn't have any work done) to totally redo the kitchen. New cabinets, new countertops, new floors (in the kitchen, living room AND dining room). New paint (and in the powder room too, where our last do-it-yourself project had mixed results), new faucet, new range hood, new pulls... no new appliances. Yes, the offending dishwasher gets a 2nd chance at life (as it's only 6yrs old) with a new intake valve. Sigh. I thought I'd track the progress of the project here-- pictures, commentary, any tips I run into along the way. 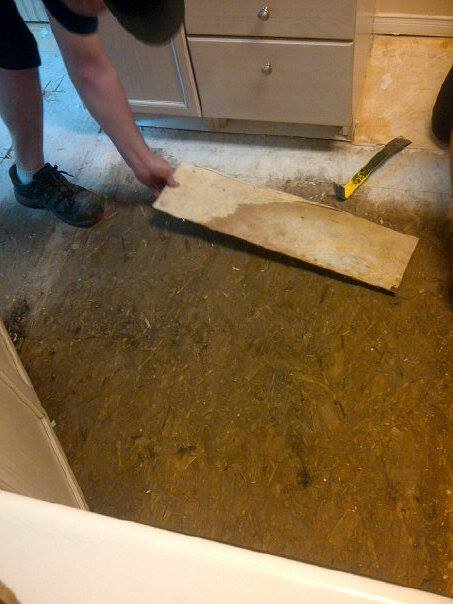 Tip 1: if your floors get wet, you DO need to pull them up, all the way to the subfloor, and the sooner the better. The emergency services folks wanted to pull them up on the Sunday when this flooding occurred, but it wasn't good timing, so we did have them come back just a week later. We've had industrial fans (to kick up the surface moisture) and a dehumidifyer running for 5 days now-- most of the floor is acceptably dry, and the section just in front of the dishwasher is still at 30% and needs to be at 12-16%, so we'll keep going until we get to that number. 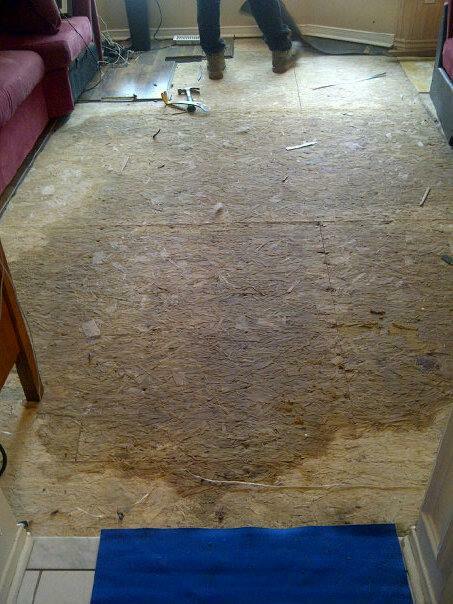 Tip 2: when you have an industrial dehumidifyer running, move the dog's water away from it. Back to the reno. Our selected contractors came by the same day the floors were removed, and listened carefully to all of our ideas. 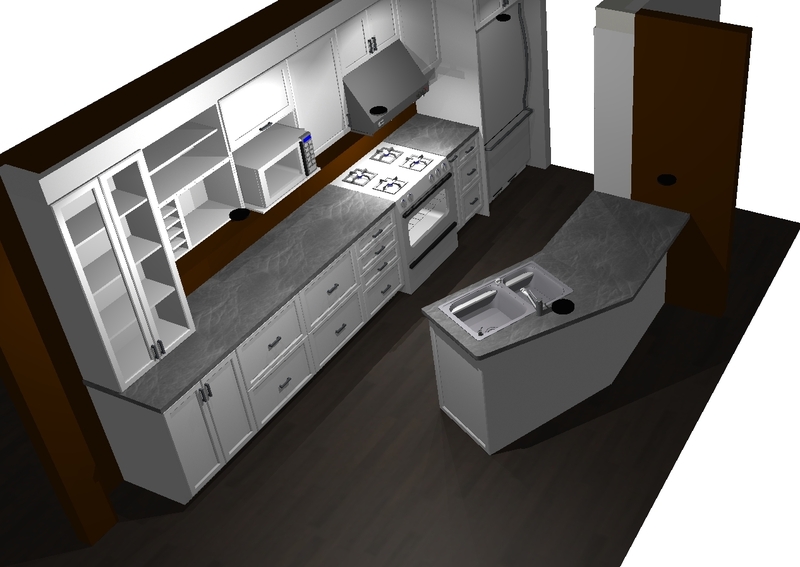 We wanted to see 2 versions of whatever plan-- one with as many of our original cabinets (just replacing door/drawer fronts) and one with everything new. a shelf where I can grow gourmet herbs indoors, some wine storage (we have plenty elsewhere) and book/collection shelving. So, that's all the news to date. Measurements have been finalized, the order placed, and other details, like packing EVERYTHING and moving it either to the basement or upstairs, are being taken care of.